Professional building inspections Sydney wide! Welcome to the Resicert Property Inspections Sydney home page. We offer complete building inspection services for your next home. When purchasing a home, you want to be certain about what you are buying. This is likely one of the major purchases that you will ever make, and a building inspection is your way ensuring your peace of mind when you purchase a property. Our building inspection process will provide you with the information and confidence that you need in order to be comfortable with your investment. Our building inspection is carried out to the highest standards. It focuses on ensuring that you will be fully informed about the house you would be purchasing. Resicert deliver the building reports Sydney buyers and investors can rely on for full information that is also easy to interpret. Our reports with full colour photographs are clear, concise and easy to understand. Your professional building inspector will thoroughly evaluate all aspects of the property you are purchasing– from the roof to the foundations and all areas in between. We not only inspect the house you’re buying, but also share with you helpful maintenance advice. You’ll get a complete education about your new home! 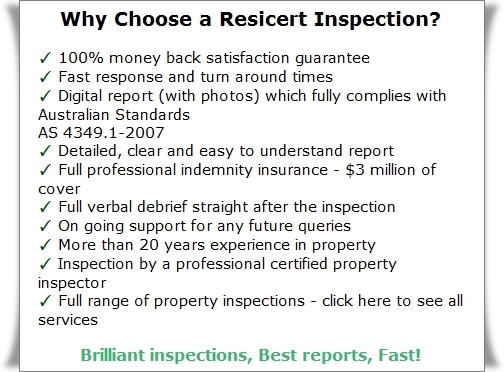 Resicert are proud to offer one of the most comprehensive property inspection services in town- and at rates that represent outstanding value for money. We will do this in a way that is clear and concise and easy to follow. Communication is key, and we like to make sure our clients know what's going on at all times. All this takes place quickly and within a few days from the booking of the inspection. This provides you with the certainty that you will be availing of the most efficient and professional service possible. We are confident that we can offer the best value for money of any Sydney based independent building inspections provider. Click here to request a quote for a professional building inspection in Sydney, or call Resicert directly on 1800 737 423. "Evan was very thorough, efficient and what was promised was delivered"
"Prompt service and thorough report." "Evan was excellent and took the time to go thoroughly through every possible detail in depth. He has a lot of knowledge and was very professional and patient; he also gave excellent advice that helped with the issues that we were having"
Click here to contact us and to book your 100% guaranteed building inspection in Sydney!